Where are the low cost carriers? Last week BA were cheapest on the CPT-JNB route and this week the BA flight price of R533 is the lowest we've recorded for the airliner since we started recorded prices on the DUR-CPT route on 19 May 2007. This represents a 30% drop in the cheapest flight prices on the Durban to Cape Town route over the last year. * one-way flights from Durban to Cape Town, leaving Durban between 1349 & 2146 on the 21st August 2009. Prices will change. ** Kulula flight MN6312 can be booked for R875 as BA flight BA6312, a saving of R322 (see our tips for cheap flights). *** SAA's lowest flight price from Durban to Cape Town since our 30 Jun 2007 survey. This blog is an account of a group of female rowers from Cape Cod's tour through South Africa. 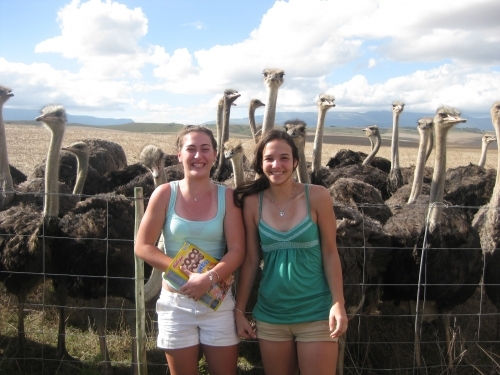 After surviving Cape Town's incredible winds, the girls took a drive to Oudtshoorn to see the ostriches and the Cango Caves. "In truth just about every small carrier that has gone belly up has faced the same problem. No matter how good the staff are, how much fun they inject into the in-flight experience and no matter how funky their aircraft paint schemes are, success or failure depends on just one thing: how low are your costs and fares in relation to those of your competitors." extract from Airlines Confidential, Lifting the lid on the Airline Industry - buy your books at the Exclusive Books website.